Welcome to our first official family travel vlog Bangkok edition. After 29 hours of traveling with kids to Bangkok, you’d think we would take it easy for a day or two. But, before we knew it, we were on a Tuk Tuk heading towards a long boat wharf to go see Wat Arun and feed the catfish before passing out once again! It started after a late breakfast and decided we just really didn’t want to hang out in the room anymore. We knew there was a small wat across the river that we could get to easily enough with the hotel ferry and a short walk. After a bit of exploring, our family decided it was time to head back, but on our short walk, we were approached by Woody the Tuk Tuk driver, who offered us a very inexpensive rate to go to a Wat with a large golden Buddha. 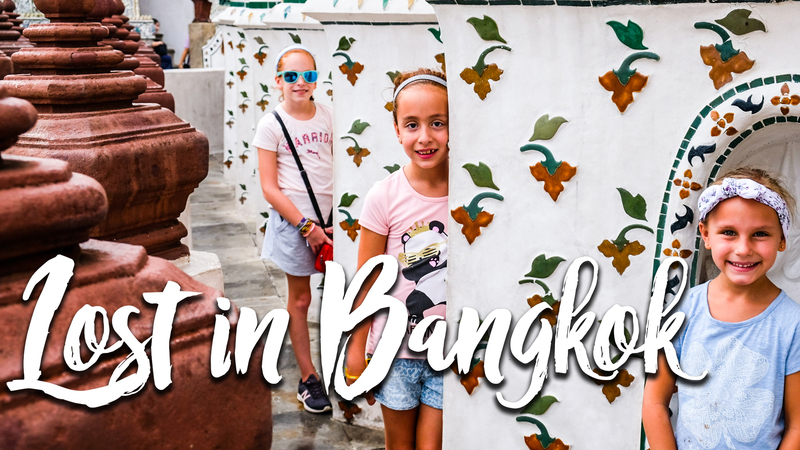 After walking around the Wat and receiving a bracelet for good fortune from one of the monks, we were feeling reinvigorated and ready to go out and explore a bit more of Bangkok. We asked to go to Wat Arun, also known as the Temple of Dawn. Woody suggested taking a boat which we thought would be a fun way to see it. After some haggling with the boat operator, literally got it for half the original asking price, our family hoped on a long boat, basically a long skinny boat that has this massive engine on it, to take us to Wat Arun and go and explore some of the canals nearby. While in the canals, the kids fed some catfish and we saw how some of the locals still live! Overall a great day, and even though we were all tired after flying to Thailand, we didn’t feel like we overdid it.